A record number of teams entered for this year’s indoor hockey season which will kick off on the weekend of 9 and 10 February at the DTS Indoor Hall. Bank Windhoek Premier League –With 5 mens’ teams & 5 womens’ teams; Reserve Premier League – (7teams for both); First League (7teams for both); Second League – 10 mens’ teams, 8 womens’ teams and the Masters League –comprising 5 Mens’ teams. “For the first time we have established the Bank Windhoek Reserve Premier League for Men and Women which is the second strongest tier league in indoor hockey and is especially created for those clubs who want to earn promotion in the future to play in the Bank Windhoek Premier League. All clubs from Windhoek, Walvis Bay, and Swakopmund have entered 62 teams, up from 54 teams last year, who will compete in five different leagues. There will be approximately 600 players involved in indoor hockey over the next three months,” said Nel. The venues where the Bank Windhoek National Indoor Leagues will be played are DTS, Wanderers, the Dome in Swakopmund, the Sports Hall in Walvis Bay and a few games at the Show Grounds in Windhoek. Pack eluded to the partnership between Bank Windhoek and the NHU over the past four years, where the sports code has thrived and the development of the sport at grassroots level was taken seriously, resulting in well developed talent feeding into the sport. 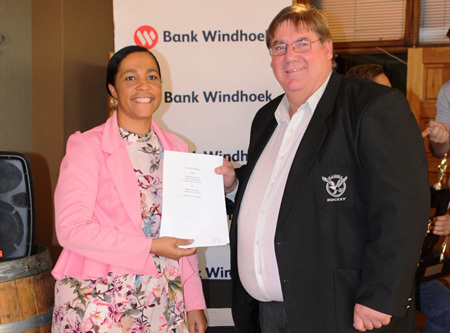 “Thanks to Bank Windhoek’s continued sponsorship, the past four years have enabled Namibian Hockey to develop and grow as one of the more prominent sports codes in Namibia. Look at the successes which our Junior and Senior National teams had the past two years internationally. Bank Windhoek’s sponsorship truly shows the Bank’s commitment to the development of the sport,” Nel concluded. Meanwhile, the Bank Windhoek Outdoor League will commence in July 2019 up to middle of October 2019. Caption: Jacquiline Pack, Executive Officer for Marketing and Corporate Communication Services at Bank Windhoek, and Marc Nel, President of the Namibian Hockey Union.